The University administration discussed with the National Petroleum Company the establishment of a petrol station in the framework of partnership between the two sides. 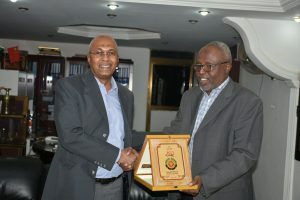 The deputy Vice Chancellor of the University Dr. Mohamed Babiker El-Awad, who received in his office Deputy Director of the company, Ustaz. Khader Mohammed Khader, in the presence of the principle of the University, expressed about their desire to establish the station to provide fuel to the employees of the University, and the residents of Wad Medani. The deputy director of the company, stressed their keenness on the establishment of the petrol station in Wad Medani as the first station follow to the company.